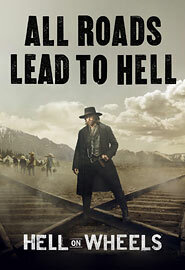 The second season of Hell on Wheels, which recently completed its second season on AMC, continued its epic story of post-Civil War America, focusing on Cullen Bohannon (Anson Mount), a former Confederate soldier, and his dramatic journey west as he struggles to leave his past behind. Produced by John Shiban, Joe and Tony Gayton and Endemol USA’s Jeremy Gold, the show depicts the traveling town known as Hell on Wheels, a dangerous, raucous, lawless melting pot that follows and services the construction of the first transcontinental railroad. The building of the transcontinental railroad serves as the backdrop to the entire series. The scope and challenges of the expanding railroad were critical to the storytelling and couldn’t be achieved without the resourceful use of visual effects provided by FuseFX.